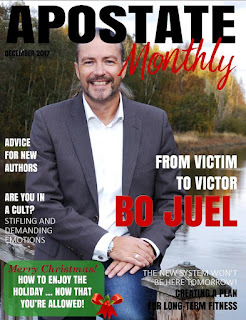 College students are on Holiday break currently, so we thought this was the perfect time to get the word out again about the common tactics used by high controlling groups and cults to recruit college students, either on or off campus. These tactics don't just apply to college students, anyone can be fall vulnerable to these tactics. However, a point should be made that cults and high control groups actually target young adults and college students because They Know this can be a likely vulnerable time in their life and they will prey on the fact that these young adults can and do make big decisions sometimes without talking openly with their parents or family. 1. This may be the first time on their own as an adult away from their family and home. This can be a lonely, scary time and they may want to fill the void by being part of a close group of people, this can sometimes feel like an instant belonging and "family" type atmosphere. 2. They may come from a very dysfunctional family in which their emotional needs were neglected. Being part of a tight group of people who give them lots of admiration and attention (Love bombing) can be very appealing for a young adult who was neglected of such basic needs. 3. Their world view sometimes can change being out on their own away from the safety and comfort of their home and family. They may want to be part of something "bigger then themselves", something that feels very important and that would or could make them proud of themselves. Helping others, changing the world for the better, these type of ideals are very appealing to most of us, who doesn't want to "help" ourselves, others or the world. High control groups and cults know the right buttons to push. 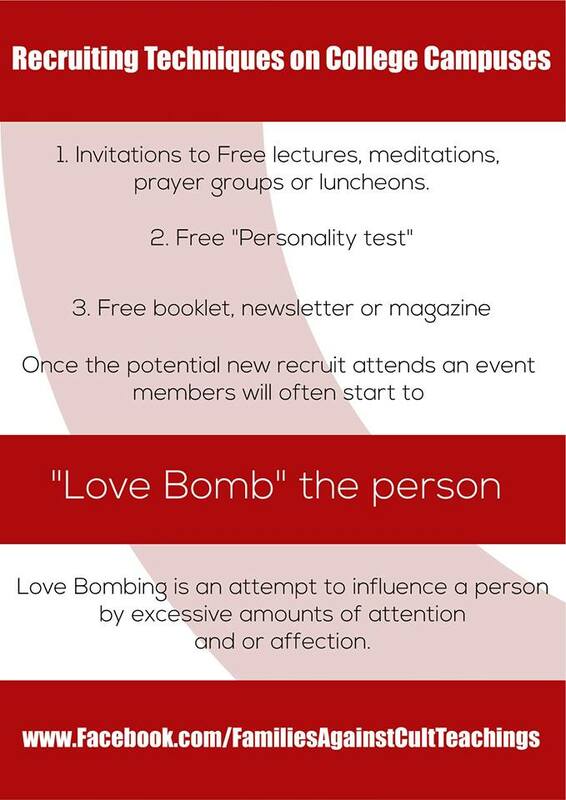 These are just a few examples of reasons young adults / college students can be vulnerable to recruitment. It is essential to educate our youth so they are armed with the knowledge and can protect themselves from manipulation and coercion. Of course some of these tactics are popular marketing practices, with that in mind, not all groups who use these tactics are out to manipulate or take advantage of people. But it is a starting point in educating young adults about the initial process of recruitment and indoctrination by high control groups or cults. Our next blog post on this topic will cover what separates a healthy group from an unhealthy group and or cult. What are healthy boundaries when being involved in a group. In the meantime please educate your children, share this blog post, our website, social media pages etc with family and friends, share in facebook groups and other social media outlets, share with educators and counselors etc. Help us educate society. As always Thank you for supporting our organization and the important cause we are tirelessly working for. Together we can make a big difference and save so many lives! Concerned about a friend or loved one who may be involved in a high control group? It could be a religious group, a gang, a new age self help meditation type of group, a guru that they seek counsel from constantly etc. Manipulation, exploitation, coercion and abuse happens in various kinds of relations. Often times an outsider can see things more clearly than someone who's involved heavily in a group setting. If you have a friend or loved one involved in a group that you are concerned about and you don't know exactly what to do yet or how to approach them, here are a few things to consider. 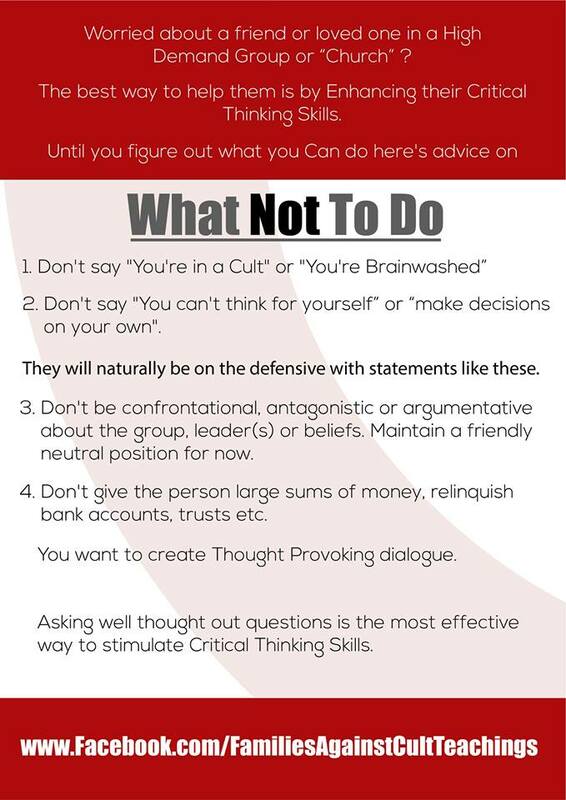 Until you educate yourself more and come up with a plan of action here is a few things you should consider Not Doing. The most effective way to help someone who's involved in these types of groups or cults is to stimulate their Critical Thinking Skills. We all know and probably have experienced that when we feel the need to defend ourselves that stimulates our Defenses and the conversation tends to lean more towards an argument or disagreement, which is not going to help the situation. We want effective dialogue so the person we're seeking to help can actually think clearer and come up with their own answers, conclusions and "ahh ha" moments. Before you have the conversation with your friend or loved one, do your homework. List out several thought provoking questions you plan on asking them. Try to do it in a non threatening manner, no raised voices, no heavy demands etc. Try to be as understanding as possible and ask specific questions that will get the person to think instead of reacting and defending their views. What are their background and qualifications? 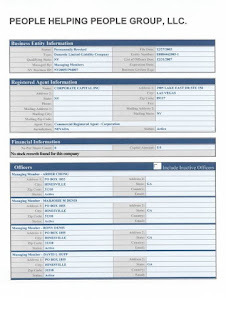 Do they have a criminal record, a legacy of allegations against them, or a history of misconduct? Do they have emotional outbursts? Do they physically abuse followers? Do ordinary people find them inaccessible, unreachable, or elitist? Are there “in” groups and “out” groups? 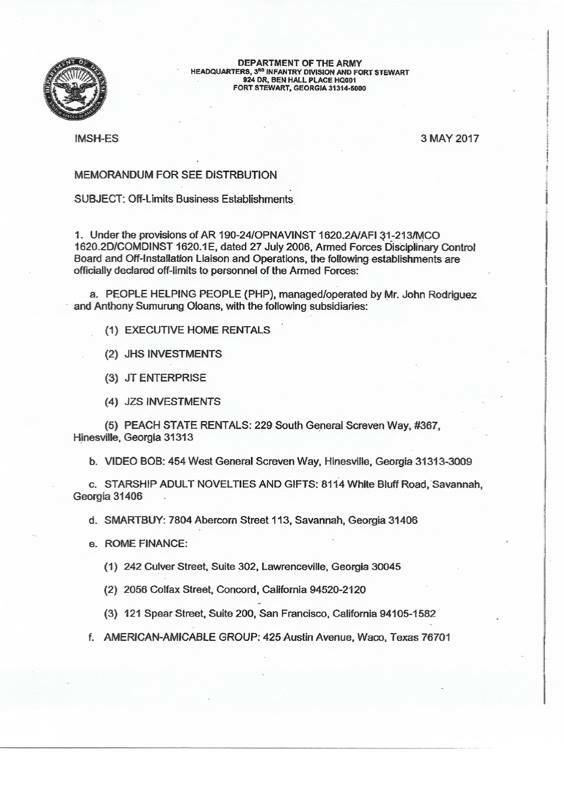 Are there secret texts and publications “for your eyes only”? Is there real financial accountability and transparency? Does the group culture discourage you from asking questions? If “miracles” have been performed, can they be replicated under open observation and scientific conditions? Are there other explanations for the “miracles,” such as magic tricks, hypnosis, etc.? Does the group attempt to shift the burden of proof for extraordinary or unverifiable claims? Are all members expected to conform to group beliefs, or can they form independent belief systems? What do former leaders and members say about the group? Does the group claim to have access to absolute truth? Does the group spread disinformation in promotional materials? Is the member being asked to give more and more of their time? For fellowship, helping to promote the group, "bible" study/classes etc? Is the member being asked for donations and monetary support? If so, is it pressured, is it required, are they looked down upon if they don't want to or don't have the funds? Does the member have a balance of personal life, work life and life apart from the group/church? In other words are other areas of life being neglected as a result of involvement in a group? Does the member have re-occurring conflicts with a spouse over involvement with the group? These are just examples of questions you may want to ask. It may take a few attempts at this topic of conversation with your friend or loved one before they are even willing to talk. Be patient and understanding, people don't knowingly get involved in high control groups or cults. They usually get involved as a way to try and resolve issues in their life or are seeking legitimate spiritual guidance or help. The last thing you want is for them to stop talking to you because you aren't being supportive or understanding. Be sure to visit our Education section on our website for more vital resources and information. 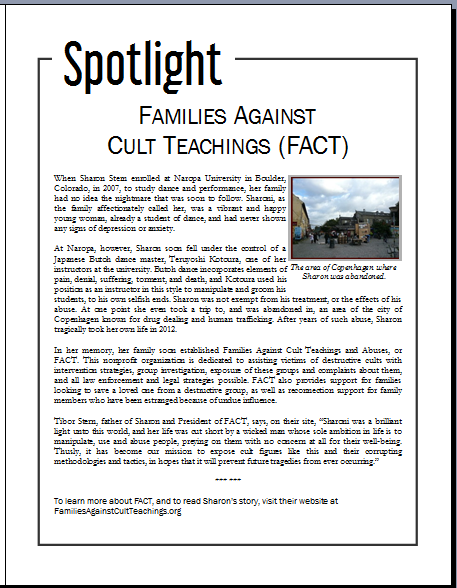 We here at FACT want to Thank you for all your involvement and support in our mission; to Save children, adults and families from exploitation, manipulation, suffering and hardship from self serving predatory personalities and groups. The year 2017 was very productive for us, we were able to help many victims and survivors of mental, sexual and monetary exploitation. However, due to our budget restraints we were limited to the number of cases we could attend to. The work we do involves a lot of darkness, investigative work, man hours and demands a plethora of truth be uncovered. One of our main goals in 2018 is to double the cases where we save lives. We urge our supporters and friends to share our work, stories and mission with your friends and family and we ask that if you can, please donate to our life saving cause. No amount is to small. Please donate what you can to help us, help others. On behave of all the victims who have experienced abuse, neglect and exploitation, and our entire team at FACT, we thank you for all of your support. We wish you and yours a Very Happy and Healthy Holiday Season. 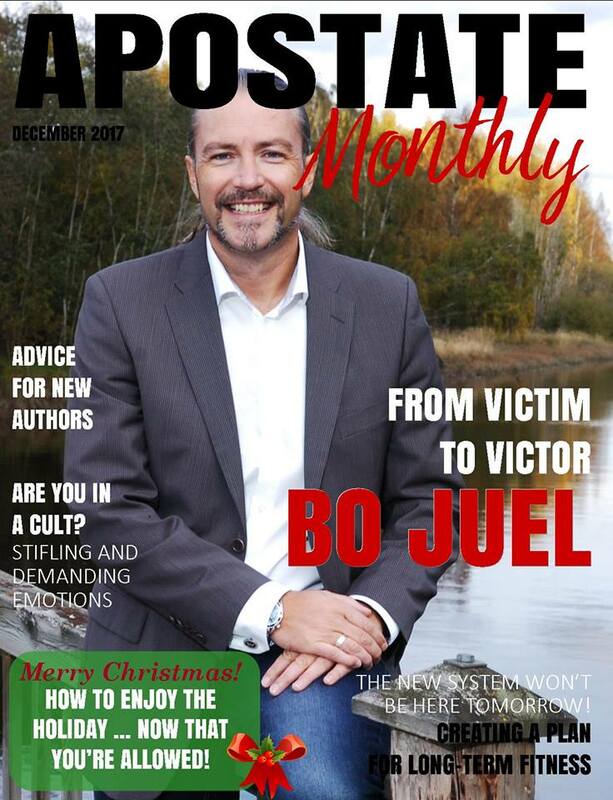 FACT is featured in a full page article in the December issue of Apostate Monthly. We'd like to Thank the editor for her thoughtfulness in including our organization in the magazine and for helping us spread our message. Awareness is key to prevention! Please Note: Our intention at FACT is never to libel or damage anyone’s reputation. The purpose of our work is to educate the public and also for HOPCC leadership to understand the severity of the allegations against them. 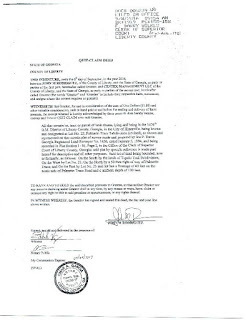 Moreover, please know that all statements made in this expose are according to our opinion at FACT, based upon signed affidavits, complaints and evidence we received from alleged victims of HOPCC, family members of those involved, etc. and through our analysis of this information according to the B.I.T.E. model (developed by cult expert Steven Hassan). 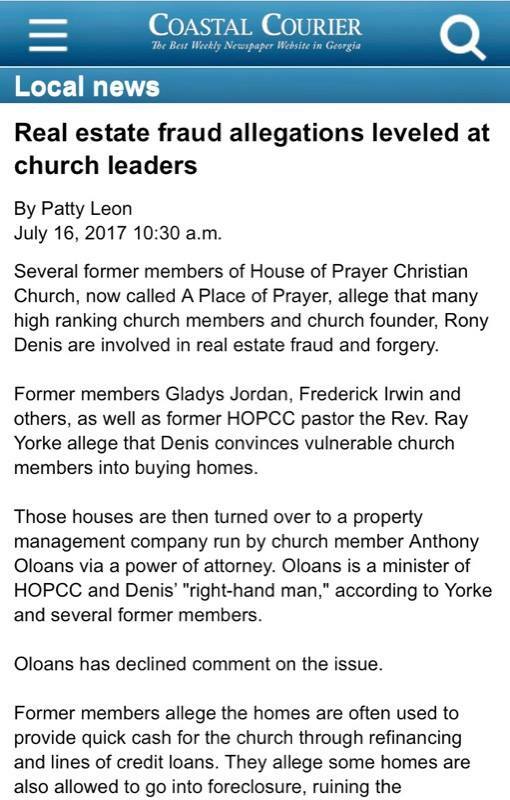 According to our analysis of the complaints, signed affidavits and evidence we have received from church insiders, ex-victims and families affected by the House of Prayer Christian Church, we believe Pastor Rony Denis, the leader of the HOPCC, is manipulating, controlling and exploiting the congregants of his church primarily for financial gain and free labor. We have been told by a few ex-members of the church that even though there are many poor individuals and families who are members of his church, Pastor Denis owns a home, in the Hinesville, GA area, that is estimated to be over 7000 square feet, in addition to a large beach home in Florida, two Rolls Royces and a Bentley, which we believe speaks volumes in light of all the above information and evidence. In an effort to effect change, ex-church members have held protests and most recently conducted a town hall meeting in order to express their concerns and inform citizens about the HOPCC. Please see the attached article from the Coastal Courier. 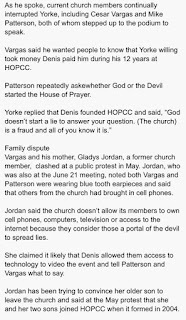 We believe it is also very important to note that in some of the complaints Pastor Denis was compared to the infamous cult leader Jim Jones who coerced over 900 people in his congregation to commit suicide. 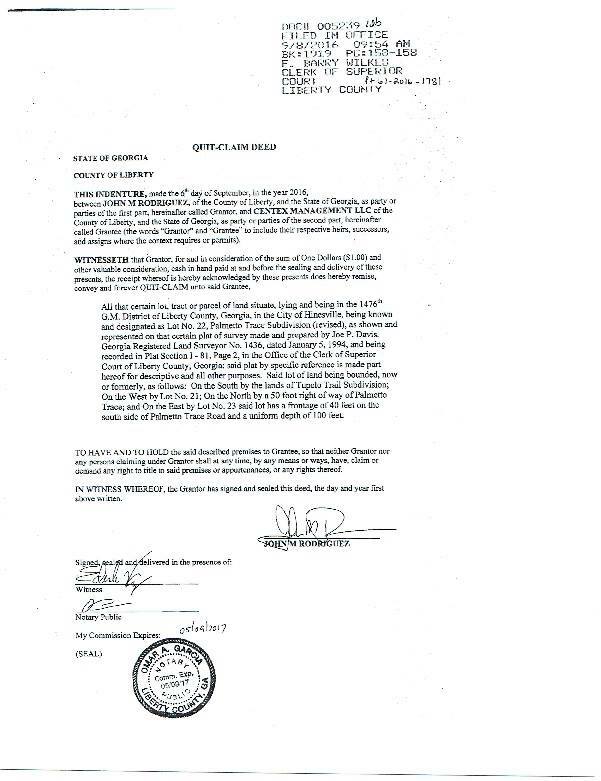 Allegedly Pastor Denis has already forced all members of his congregation to get passports in preparation for a potentially move to Jerusalem before the rapture comes next year, which according to this pastor will occur on January 13th, 2018. When we discussed this with Rev. Yorke, he said he never witnessed any talk of suicide while being a member of the church, but believes it is certainly possible. 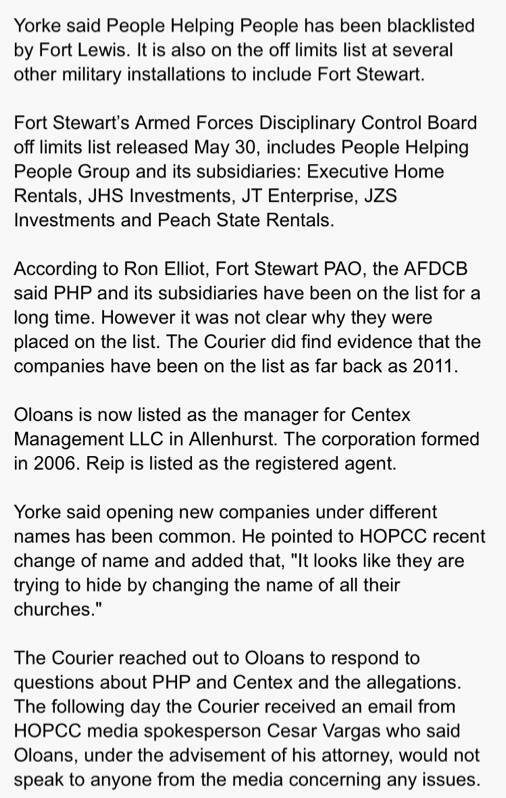 We believe it is very important that all members of the HOPCC receive and read this expose. If you are able to share this with a member of the congregation, please do so immediately as it might save their life and additional lives as well. 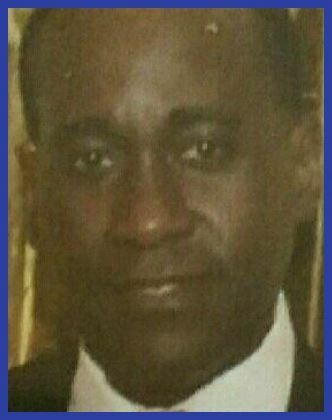 Lastly, we contacted Pastor Rony Denis as part of our investigation in an effort to give him a chance to respond to the allegations against him. 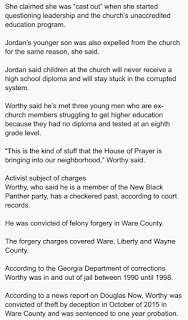 We were immediately met with a response from his lawyer, which stated, “I am the attorney for Reverend Denis and his church. You are hereby directed not to attempt any further communication with him or members of his church. All communication must be with me and me alone from this point forward. 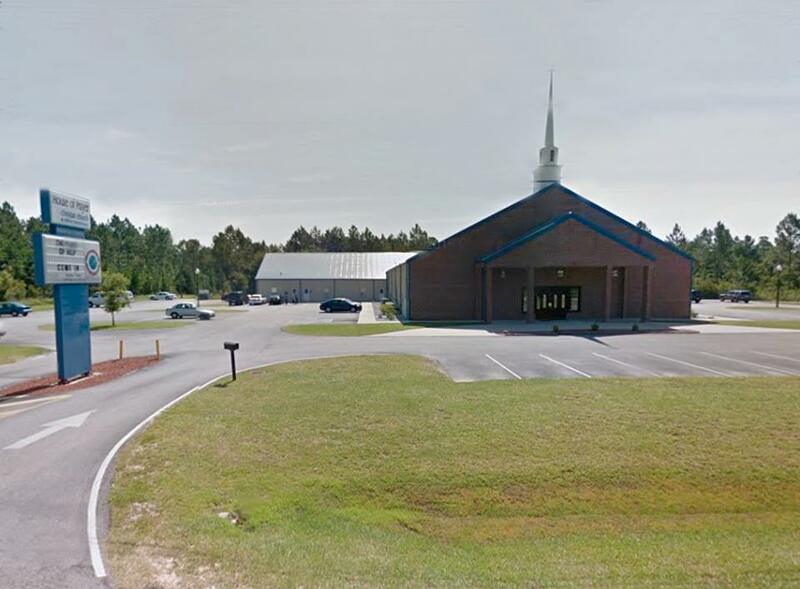 Additionally, please be advised that if you make any defamatory comments or remarks about Reverend Denis or his church, we will not hesitate to take appropriate legal action.” We believe this response speaks for itself. You be the judge. Insiders from HOPCC have alleged that the recruitment process as mostly targeting young military service men / women who are away from home for the first time. It seems that allegedly the church will send military affiliated church members to visit local bases to recruit young looking military personnel. Tomorrow we will be concluding our House of Prayer expose. Please like, comment on our posts and share this expose with others to spread the word. 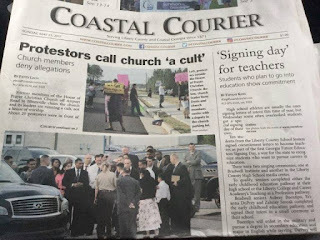 The Coastal Courier, a local newspaper in Hinesville, GA, published an article this year entitled, "Real estate fraud allegations leveled at church leaders." 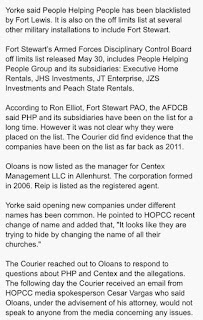 The article states that several former members of the HOPCC allege that many high ranking church members, including the founder Rony Denis, are involved in real estate fraud and forgery (see attached). 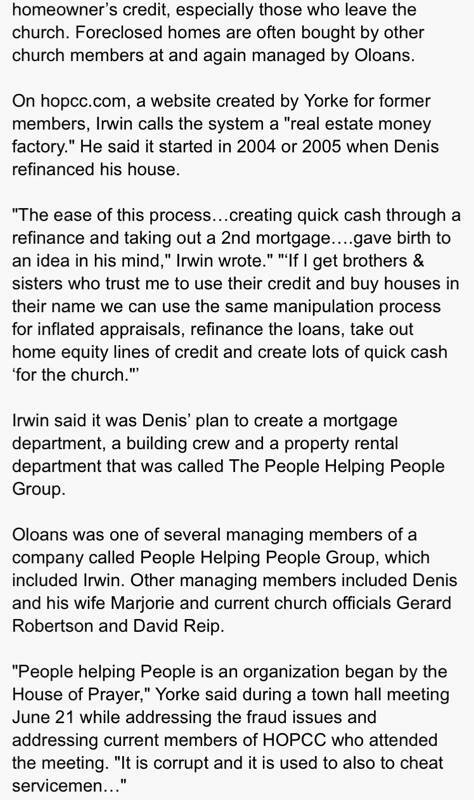 We received a list containing over 135 homes where allegedly all rental income earned goes directly to Pastor Denis. 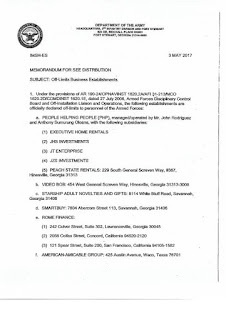 According to evidence provided, an Army headquarters in Fort Stewart, GA blacklisted a company called People Helping People LLC (and its subsidiaries) that was owned and operated by leaders of the HOPCC, which has since been permanently revoked (see attached). 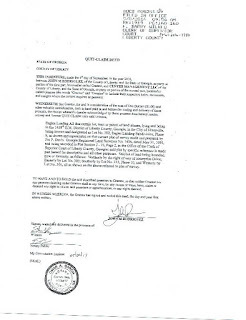 Mr. Rodriquez also alleges this about Mr. Oloans (an employee of the church): “Oloans literally stole my properties by forging mine and my wife's signatures on the 6th of September when I was at Ft. Campbell.” The documents below show two very different looking signatures even though supposedly signed at the same time (according to the time stamp), which we believe lends support to this allegation since it is obvious that the signer of these documents was not able to duplicate the signature properly. “The day we left was crazy. There was one brother that I wanted to let know, because we were close through out all of House of Prayer. He was my friend, I didn’t want to leave him in the dark, so I started to tell him what was going on, he didn’t want to here me out, the rest is history. At this time my wife and I had a lot of our stuff moved into storage, but that brother called and told on me. I wasn’t home but my wife and son were. 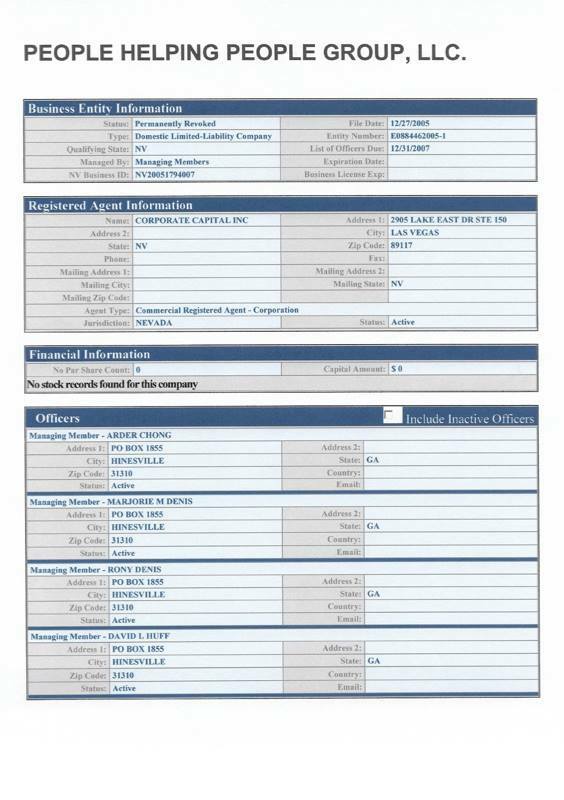 My wife called me and told me to call the police because Anthony Oloans was in our house calling for my Son trying to take him. She had took my Son and locked herself in our bedroom, Thats when two brothers were dispatched to break in to my house to try to get to my wife and Son, they had Denis on the speaker phone, and they kicked down the door to where my wife and Son were. while this was going on, Oloans had pad lock the garage and disconnected the garage door opener so that my wife couldn’t drive out, then he popped the hood, and ripped the battery out. So they broke into my wifes bed room, while her only way of escape was gone, so that they could take my son, and convince us to stay (Real Christians). 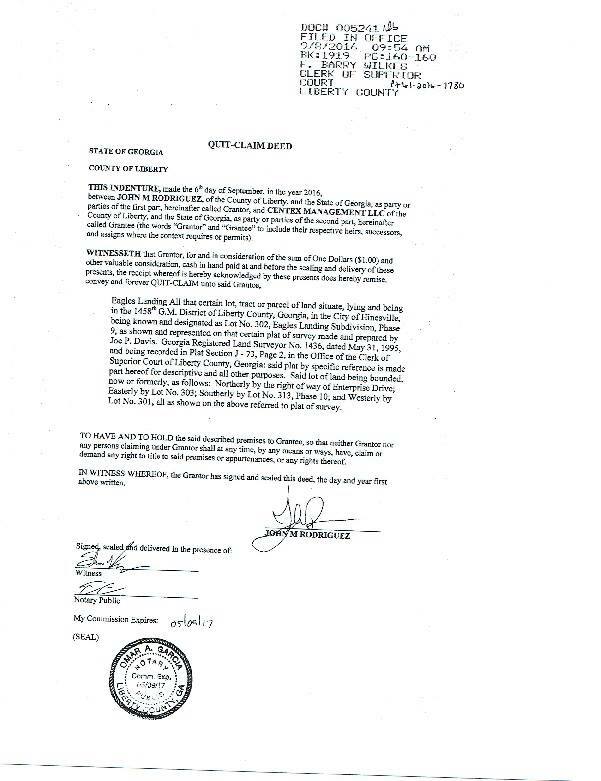 So about this time I showed up with the police, and confronted Oloans, about why he tried to kidnap my son. Later that day I got word that they said I had lost it and it was evident that the spirit of God had left me. Put yourself in my shoes, worked like a slave for 10 years without pay, your pastor gets mixed up in witchcraft, they try to steal your kid and break down the door to the bed room where your wife and kid are trying to stay safe, and they want me to walk in like a hippy and “say peace be unto all of you devils, go ahead and kid nap my son”. 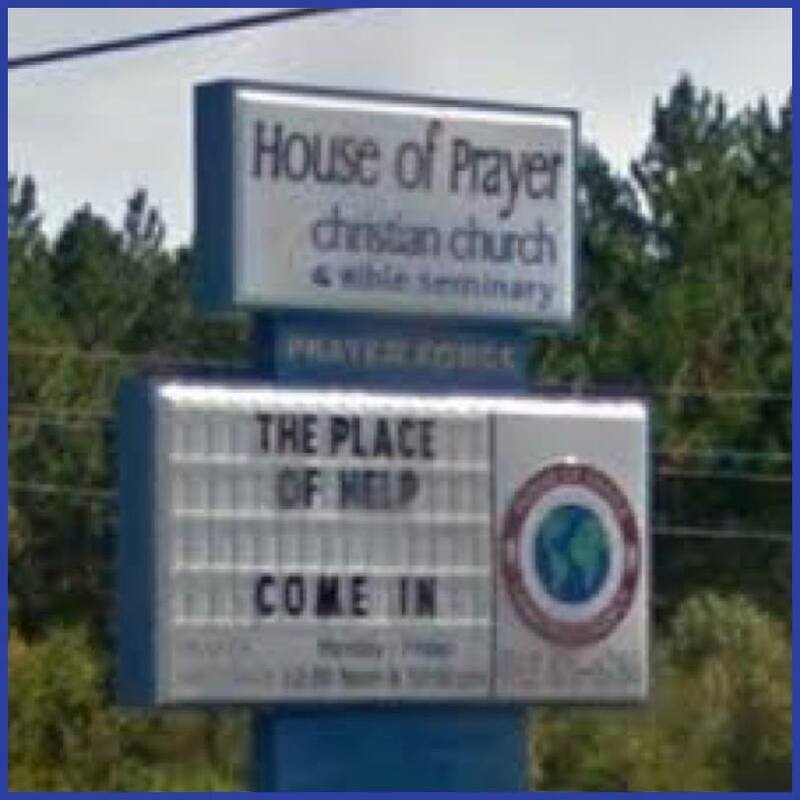 Our organization, Families Against Cult Teachings, Inc. (FACT), received numerous complaints and signed affidavits about ‘House of Prayer Christian Church’ (HOPCC), a.k.a The Place of Help, located at 2540 Airport Rd, Hinesville, GA, 31313, headed by pastor Rony Denis. 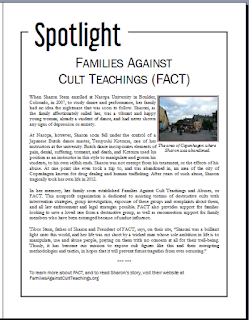 This report details our analysis of the complaints in an effort to educate and warn others about what appears to be, in our opinion, a destructive cultic church that is destroying lives and families, based on the highly documented allegations. Though the church claims to be non-denominational, ex-members of the church state that it is actually a Pentecostal and apocalyptic (end-of-times) church in belief and practice. Note: Our intention at FACT is never to libel or damage anyone’s reputation. The purpose of our work is to educate the public and also for HOPCC leadership to understand the severity of the allegations against them. Moreover, please know that all statements made in this expose are according to our opinion at FACT, based upon signed affidavits, complaints and evidence we received from alleged victims of HOPCC, family members of those involved, etc. and through our analysis of this information according to the B.I.T.E. model (developed by cult expert Steven Hassan). 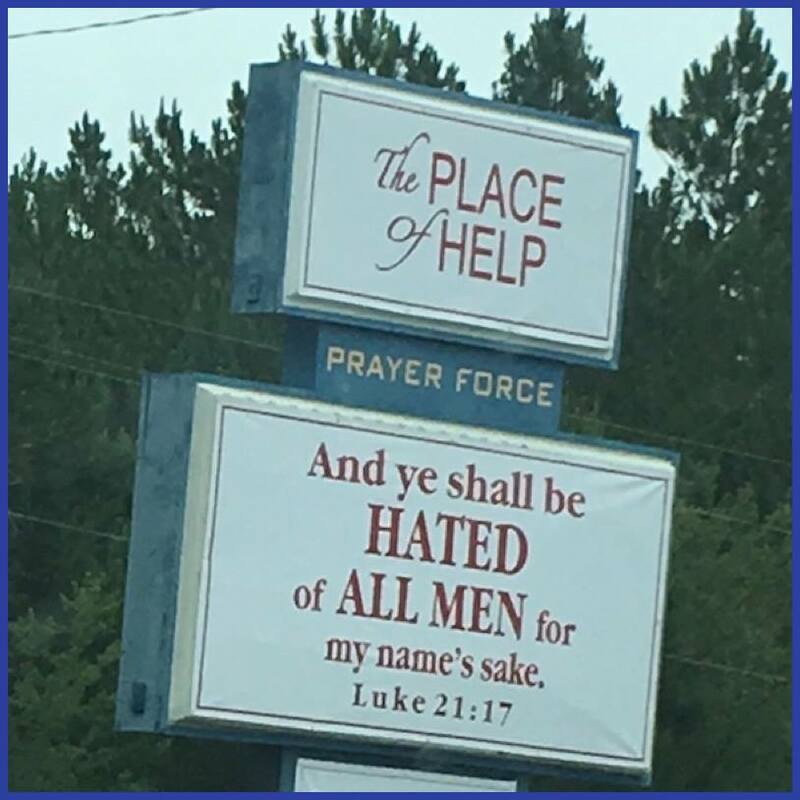 Ex-members and families affected by the House of Prayer Christian Church contacted our organization with complaints describing various kinds of alleged exploitation and abuse in detail. 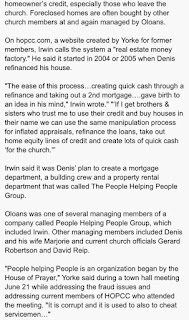 The allegations state that Pastor Denis is using members of his congregation to conduct real estate fraud and coercing members who are in the military to give up their financial benefits to the church (GI and VA income). Moreover, the complaints state that Pastor Denis is allegedly ruining many lives and breaking apart marriages and families. 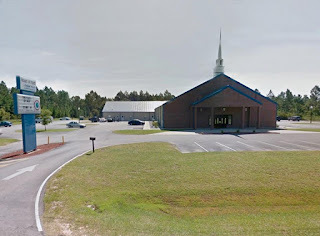 Unfortunately some ex-members have stated the development of serious mental health issues as a result of their experiences with this Pastor and church, such as PTSD and depression. The Costal Courier, a local newspaper in Hinesville, GA published various articles about the HOPCC, including one about a town hall meeting that took place on June 21st, 2017. 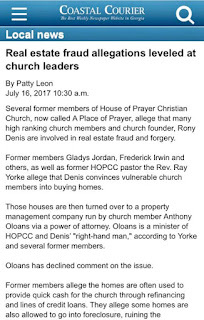 As stated in this article, Raymond Yorke claims that church leaders are manipulating members of the congregation, harassing former members with scare tactics and committing fraud.